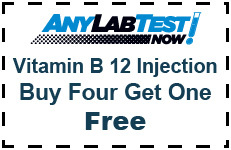 "Feel Better and Have More Energy with Vitamin B12"
With an easy and affordable Vitamin B12 injection at ANY LAB TEST NOW®, you'll have more energy for all your daily activities. Vitamin B12 is a water soluble vitamin that is one of eight essential B vitamins. It helps maintain healthy nerve cells and red blood cells and is also needed to make DNA, the genetic material in all cells. B12 is vital in keeping your body running in top condition. While B12 is found naturally in a healthy diet, factors like stress or poor eating habits can lead to a deficiency. 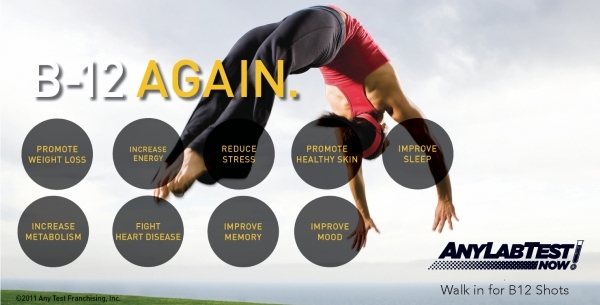 A B12 deficiency can have serious negative effects on your body. Vitamin B12 Injections are used for weight loss, healthy skin, reducing stress, energy booster, and more ..
At ANY LAB TEST NOW, you can get a Vitamin B12 injection for only $25 per injection or 5 for $100. B12 shots help your body operate more effectively and efficiently, help you lose weight and give you a great energy boost. While this may not take off the pounds by itself, B12 can get you up and moving. Many people don't exercise because they're just too tired. B12 gives you that extra boost of needed energy to lace up those shoes and start exercising. B12 also boosts your metabolism by helping you digest your food faster and burn more calories (even while sitting still). The more calories you burn, the fewer calories end up stored as fat. Plus, if you increase your exercise level, you'll boost your metabolism even more. Many people who get Vitamin B12 injections notice an improvement in their energy level within a few days, if not sooner. In addition to feeling more energy, the shots can be effective in terms of clearer skin, better sleep, improved memory and feeling less stressed. The fact is that Vitamin B12 is a micro nutrient that is used in the process of energy release. Without the presence of Vitamin B12 you could not burn calories and your energy would not be released. Often vitamin B12 deficiency anemia is not diagnosed until it is moderate to severe. Having a B12 deficiency means that your body does not have enough of this vitamin. It can lead to anemia, which means you do not have enough red blood cells to do the job and can leave you feeling week and tired. Treatment is usually shots of vitamin B12 in your arm or another muscle. Typically injections once a month will reduce mild symptoms of deficiency within a few days. You don't need to worry about getting too much vitamin B12, because your body will pass extra vitamin B12 out in the urine. Most people feel better within days of beginning treatment. How soon can I see an improvement? You may feel a difference in as little as 12 hours. Some symptoms may disappear completely within a few days, some may take a few months or longer to completely clear up, especially white spots. On the other hand, some symptoms such as eye twitching or nerve shock may vanish completely but then try to emerge again when you body starts getting low on vitamin B12. .
Vitamin B12 benefits your body in many ways. One of its key functions is to help your body in the creation of red blood cells. These cells help carry oxygen to your vital organs, including your heart and brain. Oxygen is crucial in providing you the necessary energy to get through each day. B12 also helps with white cell production, which is vital to keeping your immune system strong, which in turn keeps you healthy. Vitamin B12 properly maintains your nervous system and helps to keep nerve cells healthy. This in turn keeps your brain functioning the way it should. B vitamins also assist in the production and regulation of DNA, which is present in every cell in your body. Since this nutrient is also a very strong antioxidant, it helps fight off free radicals which can lead to cancer. It is important that your body gets some vitamin B12 every day. It helps metabolize the food you eat so you can utilize it for energy. It does this by helping turn the carbohydrates in your food to glucose. When glucose is released into your system, it gives you energy. Many people who struggle with fatigue and low energy often have a vitamin B12 deficiency. Can B12 Lower Dangerous Homocysteine Levels? Vitamin B12 is also very important when it comes to helping your body metabolize a particular amino acid called homocysteine. Homocysteine often referred to as HCY, can be dangerous to your health if the levels become too high. This is often due to a vitamin B12 deficiency. Too much HCY can be very destructive to your veins and arteries. Toxic levels of this amino acid in your blood can lead to stroke, heart disease and even Alzheimer's. Vitamin B12 helps keep your HCY at a safe levels in your body. Vitamin B12 also plays an important role in your overall mood. It has been discovered that people who have plenty of B12 in their system tend to respond better to treatment for depression. It also helps you think more clearly, concentrate better and remember things more readily. This may be due to the important role B vitamins play in maintaining a healthy nervous system.